Highland Hills is an intimate 55+ community in Mesquite, Nevada. This age-restricted enclave of 68 homes is located in the master-planned Highland Vistas community. Living in Highland Hills gives residents proximity to several area attractions and a beautiful golf course that runs through their backyards. 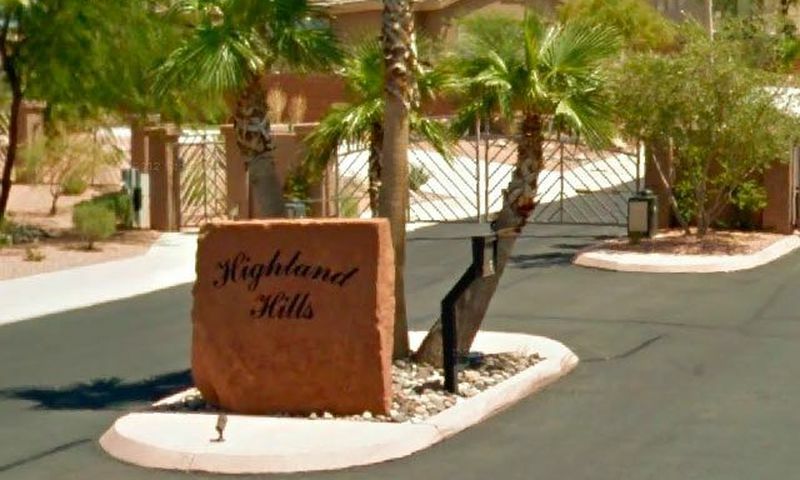 With ranch-style homes and terrific outdoor space, Highland Hills makes the most out of its Southern Nevada location in a close-knit community atmosphere. Although Highland Hills has no on-site amenities, many residents are members of the nearby Mesquite Recreation Center, providing everything homeowners need to stay physically and socially active. With two gymnasiums, two racquetball courts, and an aerobics and dance studio, staying in shape has never been easier. There is also an indoor pool for getting in a few early morning laps or for a refreshing swim after a workout. There are also locker rooms for safekeeping while you enjoy the amenities. Outdoors, the Mesquite Recreation Center boasts a pool and soccer field. Residents also have the Falcon Ridge Golf Course just across the street from the community's gates. With 18 holes of beautifully landscaped greens, golfers of all levels will enjoy teeing off at the feet of cliffs or the beautiful rolling hills that surround this par-71 course. For honing other parts of your game, the Falcon Ridge Golf Course provides a driving range and putting green. Scotty's Bar and Grill is a perfect place to grab a bite with friends after a game. Highland Hills is comprised of 68 single-family homes. Constructed between 2005 and 2006, the homes within this 55+ community range in size from 1,585 to 3,048 square feet and offer two to four bedrooms, two to three bathrooms, and an attached three-car garage. Active adults will love that these homes boast covered patios, vaulted ceilings, Corian countertops, and views of Falcon Ridge Golf Course. Residents of Highland Hills love living in an intimate community where neighbors become fast friends and homeowners can stay physically and socially active. The nearby amenities provide Highland Hills with natural gathering points for community get togethers or to establish an exercise routine. Residents will also have more time to spend as they please thanks to the monthly homeowners' association fee that covers front and back landscaping, trash collection, pest control, and water. Highland Hills is located in the lovely town of Mesquite, Nevada. The award-winning Mesa View Regional Hospital is just down the street. Interstate 15 is conveniently located just a mile away and, when your next destination is farther, McCarran International Airport is about 85 miles away. Walmart Supercenter is conveniently located around the corner from Highland Hills. Mesquite attracts year-round visitors thanks to its hospitable climate and great attractions. Mesquite is home to an assortment of spas, golf courses, and several parks and natural areas to explore. Although Las Vegas is just a short drive away, residents don't have to leave Mesquite to see museums, enjoy a night at a casino, or have a fantastic meal at a world-class restaurant. Highland Hills in Southern Nevada is the ideal 55+ community for residents seeking a friendly community in a highly desirable area. Although Highland Hills does not have on-site amenities for residents, most homeowners are members of the Mesquite Recreational Center just down the street. The Mesquite Recreational Center is located at 100 West Old Mill Road. The Falcon Ridge Golf Course winds its way throughout Highland Hills and is just across the street from the community. Golf is available on a pay-per-play basis. This par-71, 18-hole course is located at 1024 Normandy Lane. Check back soon for more information on the lifestyle in Highland Hills. Highland Hills is comprised of 68 single-family homes. Constructed between 2005 and 2006, the homes within this 55+ community range in size from 1,585 to 3,048 square feet and offer two to four bedrooms, two to three bathrooms, and an attached three-car garage. Active adults will love that these homes boast covered patios, vaulted ceilings, Corian countertops, and views of the Falcon Ridge Golf Course. Please Note: Not all floor plans are available at this time. 55places.com is not affiliated with the developer(s) or homeowners association of Highland Hills. The information you submit is distributed to a 55places.com Partner Agent, who is a licensed real estate agent. The information regarding Highland Hills has not been verified or approved by the developer or homeowners association. Please verify all information prior to purchasing. 55places.com is not responsible for any errors regarding the information displayed on this website.